The church was brand new, the third Anglican church to be built in Yonago. 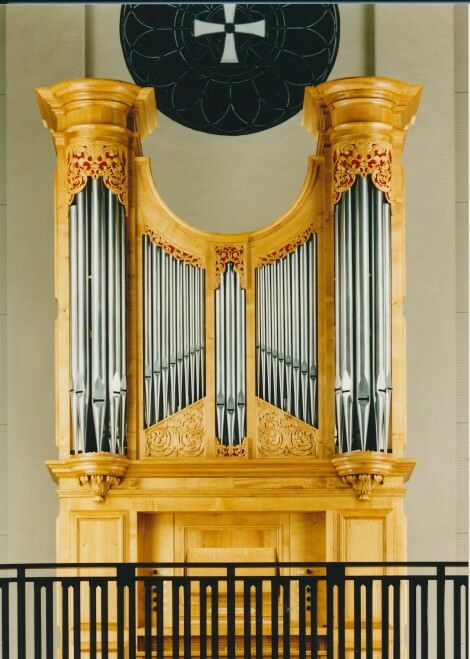 This is a new organ based on the organs of Richard Bridge at Christ Church Spitalfields (1735) and St Leonard Shoreditch (1756) in London. The case is based loosely on the 1716 organ case at St Lawrence Whitchurch. The organ project was assisted by Paul Hale at Southwell Minster, the then Vicar Clement Nobuoko, and churchwarden and amateur organ builder Moses Sakoda. The compass is C – g3 and C – f1. The pitch is a1=440Hz and the tuning is Young’s. The scaling of the principals is the same for each rank: 3:5 with a 12″ plate width at 51/3’G. The Stopt Diapason has the same scale as the Open at the same pitch. The wind pressure is 57mm for the manual and 76mm for the Pedal. The wind is provided by a 2m x 1m single fold wedge bellows, with a sprung regulator for the Pedal.